Where Roots And Wings Entwine: Bits, bobs and bargains thanks to Asda. Bits, bobs and bargains thanks to Asda. 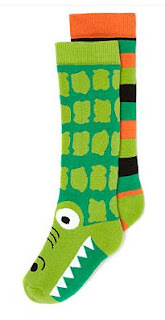 I want to get little man some small bits and pieces as presents to go in his Christmas stocking. I have had a few ideas of what to get him, a few of which are things I need to get him regardless of Christmas such as socks as his little feet are not so little anymore and growing fast. I have picked up a few bits and bobs to pop in his stocking for a few weeks now when something inexpensive has caught my eye when out and about. I also planned on hopefully getting a few things from Asda when I visited my sister (unfortunately the nearest Asda to me is over 45 miles so I always drop in to the store that is a few miles from my sisters when we visit her). As I have a fondness for the George clothing range for children I hoped on getting little man some new clobber and as I got a few cheap toys there last year for little man’s stocking I hoped I would find some cheap toys there for this year too. I could not resist getting a pair of the soft, brightly coloured Croc Welly Socks to keep little man’s feet cosy and warm in his wellies when we go out puddle jumping in the big puddles that have been created by the constant rain that we have been having. 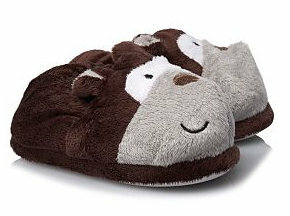 I also bought him some super cute Monkey slippers to keep his feet cosy at home. Little man also got some colourful t-shirts and cute pyjamas. Unfortunately I did not see any toys there that were suitable for his age that would make perfect stocking presents. 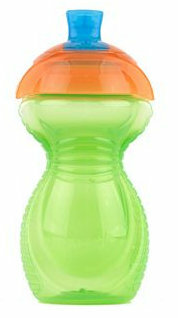 I did however manage to get him a new Munchkin Click Lock Cup which was great as they are the only cups I have found to be truly leak and spill proof and I cannot find them to buy locally. Even though Lee and I have agreed not to get presents for us, only treating little man, it is Lee’s birthday on the 21st so I hoped to maybe get him a gift, perhaps a top or a snug jumper. Unfortunately I did not see anything that I thought he would like and the only thing I did see where a pair of socks (boring I know but you can never have enough socks) with the Spurs logo on (he is a huge Tottenham Hotspurs Fan) but sadly they only had them in children’s size and I do not think he would appreciate a pair of socks that are way too small or a pair that fit perfectly but are emblazoned with a rival team’s logo. There were a few gift sets for men but a lot were alcohol related and as Lee does not drink they were suitable for him. I was a tad disappointed in the range of Christmassy clothes for little ones and unfortunately did not see any Christmas inspired fancy dress to get little man. Even though the range of Christmassy clothing was lacking in that particular store their selection of decorations was decent with plenty of sparkle and Christmassy themed decorations to choose from. Little man choose a sparkly new decoration to adorn our tree. We got a few bits and bobs to go in little man's stocking, all great value and a few were brilliant bargains. The only downside to our most recent trip to Asda was how manic it was with upcoming Christmas making everyone go mad, the parking was horrendous and we witness a fight for a parking space and the store was crowed with people filling their trolleys until they were brimming.